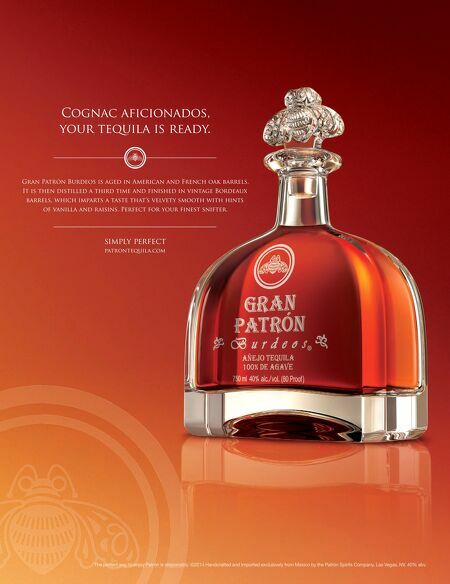 patrontequila.com simply perfect Gran Patrón Burdeos is aged in American and French oak barrels. It is then distilled a third time and finished in vintage Bordeaux barrels, which imparts a taste that's velvety smooth with hints of vanilla and raisins. Perfect for your finest snifter. Cognac aficionados, your tequila is ready. The perfect way to enjoy Patrón is responsibly. ©2014 Handcrafted and Imported exclusively from Mexico by the Patrón Spirits Company, Las Vegas, NV. 40% abv. The perfect way to enjoy Patrón is responsibly. ©2014 Handcrafted and Imported exclusively from Mexico by the Patrón Spirits Company, Las Vegas, NV. 40% abv. The perfect way to enjoy Patrón is responsibly. ©2014 Handcrafted and Imported exclusively from Mexico by the Patrón Spirits Company, Las Vegas, NV. 40% abv. The perfect way to enjoy Patrón is responsibly. ©2014 Handcrafted and Imported exclusively from Mexico by the Patrón Spirits Company, Las Vegas, NV. 40% abv.